A healthy debate is expected at tonight’s Ocean Beach Town Council meeting regarding the San Diego Union-Tribune’s practice of distributing their “Local Community Values” advertising circulars. 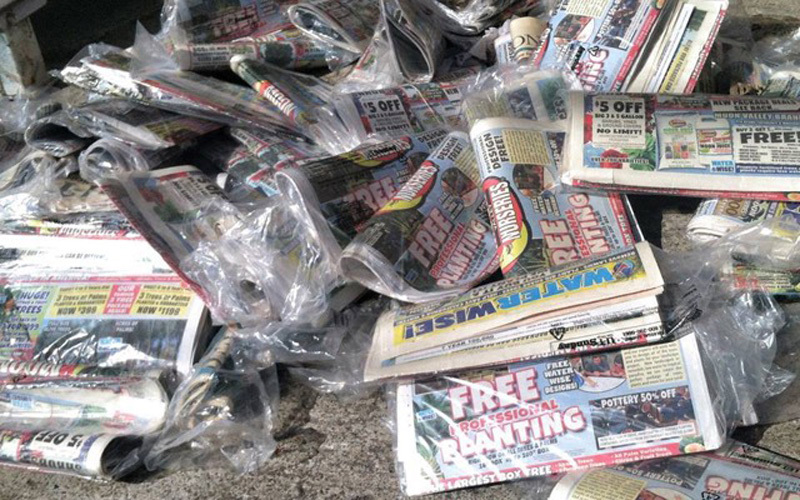 “I’ve been picking these things up from in front of my house and getting annoyed about it for a long time,” said OB resident Mary Tolena, who will present a case to the council to have the Union-Tribune end its practice of tossing out hundreds of the plastic-wrapped circulars in the neighborhood each week. She says the advertisements are supposed to be targeted to subscribers, but instead they are sent out willy nilly and end up sitting on neighborhood sidewalks and in yards, creating a nuisance. Town Council president Gretchen Newsom said officials from the Union-Tribune confirmed they would be at tonight’s meeting. Calls to the newspaper have yet to be returned. She said the Union-Tribune told her only 490 of the circulars are distributed in the 92107 zip code. “It feels like it’s more than 490,” she said. There is supposed to be a way for residents to opt out from receiving the advertisements. But their distribution seems to be scattered and bunched up on particular streets. For example, they never seem to be distributed along Newport or Santa Monica avenues, but go just a few blocks in either direction and you’ll find sometimes dozens of them together on one small stretch of sidewalk. “They tend to put them on streets that are more single family,” Tolena said. She started a Facebook campaign with a survey of local residents about the practice. Of the nearly 300 responses, only a dozen or so said they like receiving the circulars. “There apparently are some people who are really into couponing and they get the coupons out of these,” Tolena said. She wants to see the Union-Tribune completely end their distribution of the circulars. Newsom said that is a bit of wishful thinking to completely ban the circulars from the neighborhood. Newsom said she was hoping to come to a compromise to keep the wasteful ads off the sidewalks where they’re not wanted, but still allow people to receive them if they would like. Tolena hopes to hear from OB residents at tonight’s meeting, which starts at 7 p.m. at the Masonic Lodge, 1711 Sunset Cliffs Blvd. I am not a UT subscriber and one of these winds up on my lawn each week. I had no idea who distributed them but if I had know, I would have saved them up, shredded them, and delivered the result to the UT’s front door. If it doesn’t stop, I’ve got a shredder warming up. You can call the number printed on the plastic bag and opt out. These are NOT issued to UT subscribers only; it’s 2 different items delivered by the same company. 1 Rowley, It’s not nice to confuse an old man like me. I got this comment in my email and it played hell with my memory because I couldn’t recall making a recent comment on these bags. It was with great relief that I saw the comment was on a story from a year and a half ago so my fears of creeping senility were – momentarily – assuaged. That said, thank you for that tip, I will keep it in, hmmm, not in mind, that glass is full, maybe I’ll print it out and file it…somewhere. Oddly enough though, I haven’t seen any of these bags of ads for a long time but if I do, and if I can find that file, I’ll know what to do. Thank you, and that I mean seriously.